After the Mobile App Europe conference held in Sep, I was invited to QAI STC at Bangalore and Think Test conference at Delhi. I had started my professional speaking with STC way back in 2009 with talk on Weekend Testing. It was nice to go back to STC as a Keynote Speaker this time. I met many friends and made many more. 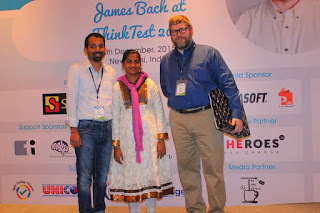 I missed meeting Shrini as he was to talk the next day and I was flying to Delhi for the Think Test conference. The talk went well and the audience seemed to like it. Many appreciated immediately after the talk. 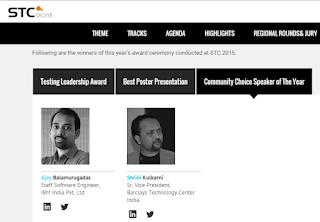 Today, I got to know that I had won the "Community Choice Speaker of the Year" along with Shrini Kulkarni. After STC conference, I and Abi flew to Delhi on 04th Dec. Thanks to Smita and Santhosh, we had the Mobile Testing Workshop at Times Internet office. It was a full day workshop and was an excellent opportunity to take Test Maniac to Delhi. After the workshop, we went to meet James Bach. He gave us an exercise and we solved it. It was a good thinking session and we chatted close to two hours. The next day, we were on time for ThinkTest. I presented on 50+ tips to improve tester-programmer relationship based on my book. Good sessions were on offer. I need more time to go through my audio recordings again and collect my takeaways. 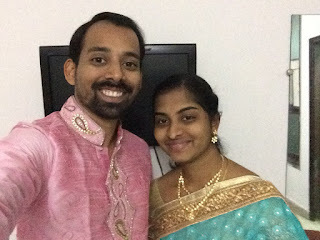 After the conference, we left for Panipat for Sanket's wedding - our first experience of a North Indian wedding. Till next time, take care and be fearless while testing !! !